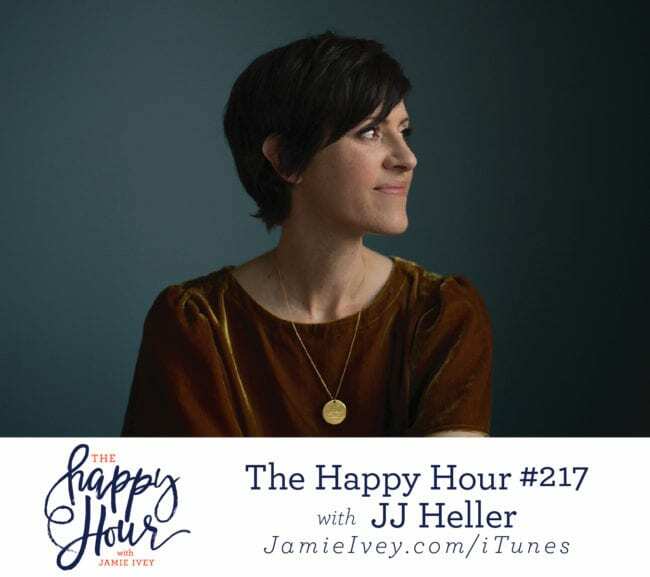 My guest for The Happy Hour #217 is JJ Heller. JJ is a singer/songwriter committed to spreading a message of hope and peace to women in an increasingly complex, competitive and confusing world. JJ has developed an iconic and unmistakable style of her own, and her music inspires listeners to embrace the beauty and brokenness of life with a whole heart. JJ and her husband Dave reside in Nashville with their two daughters. JJ and I start off the show talking about comparison. Friends, we all do it and we all know we need to stop! God gave JJ a new perspective to consider when the internal comparison talk starts, and it's something we can all remember and use. JJ then shares how the life and dreams she had as an athlete suddenly came to a close. Feeling unsure of what was next for her, God planted the seed in her heart for music while she was singing a song washing dishes in the bush of Africa! JJ then opens up about suffering from panic attacks and anxiety. JJ speaks about how it was difficult to share her story, but God nudged her to use her voice - and in a big way! She speaks about the freedom she felt after telling her story, and you will absolutely love hearing the many ways she has seen God use her story of brokenness to bring healing to others. In the last part of the show, we hear more about JJ's music and how a conversation with Bob Goff (yes, THE Bob Goff), changed her view on what success looks like. Friends, I absolutely loved talking with JJ and could have talked with her for hours. If you are struggling with fear and anxiety, my hope is that you heard that you are not alone, and that God can bring healing and use our brokenness for good. I also hope you feel encouraged to share your story with a trusted friend and together we can support each other on our journeys. JJ's Blog Post "You're Not Going Crazy"
FabFitFun Box - use code: IVEY to get $10 off first box! ThirdLove - 15% off First Order!